Why does the UK need a new runway? Why is a third runway at Heathrow the government’s preferred option? How would expanding Heathrow benefit the whole of the UK? What are the 2 aviation consultations? 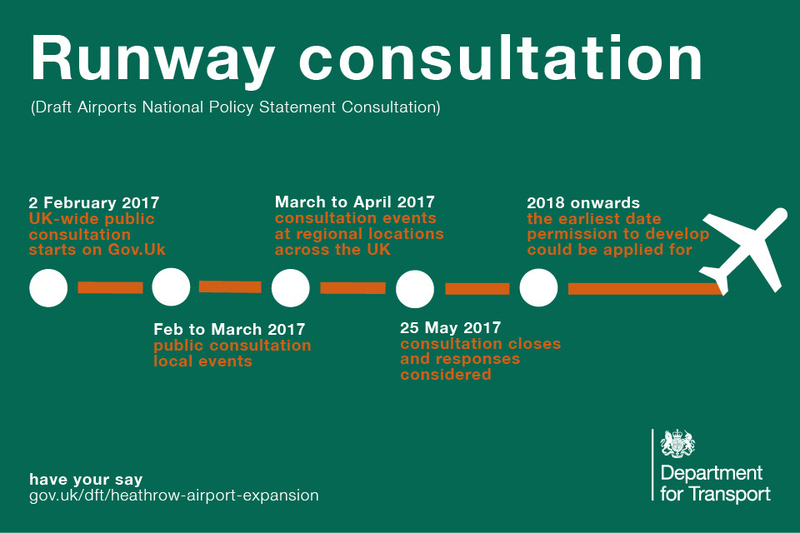 Which consultation relates to expanding runway capacity? 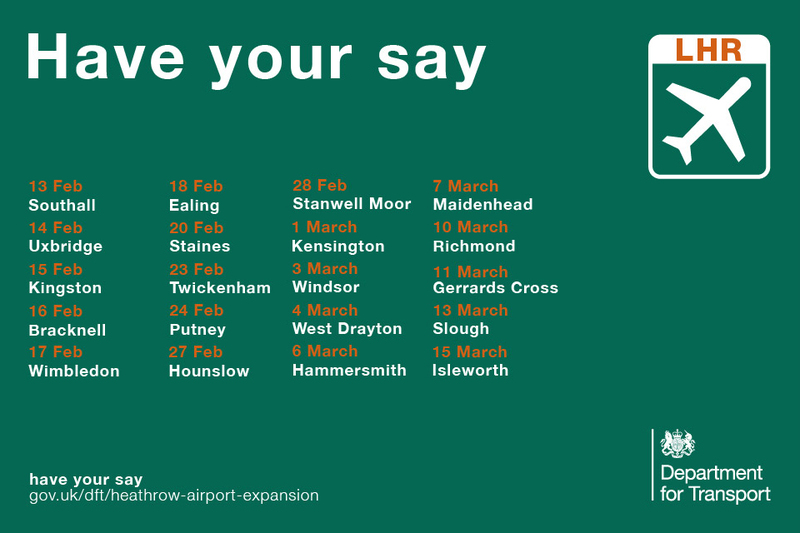 Which consultation relates to reforming the policy on UK-wide airspace? What are the timeframes for the consultations? Why should I get involved in the consultations? Am I eligible to take part in the consultations? How can I take part in the consultations? How is the government addressing environmental concerns? I am a Heathrow local resident, where can I find out more information about compensation? Aviation is vital for the whole of the UK. A new runway will give passengers access to more airlines, destinations and flights. If we do nothing, London’s airports will be full by 2040. Heathrow is well connected to the rest of the UK by road and rail connections. The consultation on the government’s draft Airports National Policy Statement is about expanding runway capacity and airport infrastructure in the south-east of England. The consultation on reforming the policy on the design and use of UK airspace is about proposals to update UK-wide airspace policy. Both consultations start on 2 February 2017 and last for 16 weeks, closing at 11.45pm on 25 May 2017. To give us your opinions on what are important issues that affect all the UK. The consultations are open to everybody. You can also come to a free consultation information event. The government would expect Heathrow Airport Ltd to provide an appropriate community compensation package, at least in line with its public commitments. All elements of the compensation package are subject to public consultation and would be examined as part of the planning process. Development consent would be conditional on the provision of a package of compensation for local communities. See information on Heathrow Airport’s compensation proposals for local communities. In a major boost for the UK economy the government today (25 October 2016) announced its support for a new runway at Heathrow – the first full length runway in the south-east since the second world war. The scheme will now be taken forward in the form of a draft ‘National policy statement’ (NPS) for consultation. The government’s decision on its preferred location, which will be consulted on in the new year, underlines its commitment to keeping the UK open for business now and in the future and as a hub for tourism and trade. Today’s decision is a central part of the government’s plan to build a global Britain and an economy that works for everyone. This is just one of a series of major infrastructure investments that will create jobs and opportunities for every part of the UK. A new runway at Heathrow will bring economic benefits to passengers and the wider economy worth up to £61 billion. Up to 77,000 additional local jobs are expected to be created over the next 14 years and the airport has committed to create 5,000 new apprenticeships over the same period. The step that government is taking today is truly momentous. I am proud that after years of discussion and delay this government is taking decisive action to secure the UK’s place in the global aviation market – securing jobs and business opportunities for the next decade and beyond. A new runway at Heathrow will improve connectivity in the UK itself and crucially boost our connections with the rest of the world, supporting exports, trade and job opportunities. This isn’t just a great deal for business, it’s a great deal for passengers who will also benefit from access to more airlines, destinations and flights. This is an important issue for the whole country. That is why the government’s preferred scheme will be subject to full and fair public consultation. Of course it is also hugely important for those living near the airport. That is why we have made clear that expansion will only be allowed to proceed on the basis of a world class package of compensation and mitigation worth up to £2.6 billion, including community support, insulation, and respite from noise – balancing the benefits and the impacts of expansion. Expansion at the airport will better connect the UK to long haul destinations across the globe and to growing world markets including in Asia and South America, bringing a significant boost to trade. Heathrow already handles more freight by value than all other UK airports combined, accounting for 31% of the UK’s non-EU trade, and its expansion will create even more opportunities for UK business to get their goods to new markets. While there are clear gains for business, passengers will also benefit from a greater choice of airlines, destinations and flight times. The Airports Commission, chaired by Sir Howard Davies, anticipated that a new runway would bring in new capacity to meet demand and allow greater levels of competition, lowering fares even after taking into account the costs of construction. Expansion costs will be paid for by the private sector, not by the taxpayer. It will be for the Civil Aviation Authority (CAA), as the independent industry regulator, to work with Heathrow Airport Ltd and airlines operating at the airport, on the detailed design and costs to ensure the scheme remains affordable. The government expects the industry to work together to drive down costs to benefit passengers. The aim should be to deliver a plan for expansion that keeps landing charges close to current levels. This new runway will deliver major economic and strategic benefits to the UK, but it must be delivered without hitting passengers in the pocket. The Airports Commission was clear that this is achievable as is the CAA. A third runway will also support new connections to the UK’s regions as well as safeguarding existing domestic routes. Heathrow has proposed a further 6 new routes to Belfast International, Liverpool, Newquay, Humberside, Prestwick and Durham Tees Valley to be added after expansion. The 8 existing routes offered today are: Edinburgh, Glasgow, Inverness, Aberdeen, Belfast City, Manchester, Newcastle and Leeds Bradford. This would provide 14 domestic routes in total, and spread benefits right across the country. Government will also take all necessary steps including, where appropriate, ring-fencing a suitable proportion of new slots for domestic routes, to ensure enhanced connectivity within the UK. Despite the increase in flights Heathrow Airport Ltd has made firm commitments to noise reduction. The government will propose that a six-and-a-half hour ban on scheduled night flights will be introduced for the first time at Heathrow and will make more stringent night noise restrictions a requirement of expansion. The timing of this ban will be determined through consultation. Furthermore, the government proposes new legally binding noise targets, encouraging the use of quieter planes, and a more reliable and predictable timetable of respite for those living under the final flight path. The airport has also pledged to provide over £700 million for noise insulation for residential properties. In addition, modernising use of our air space will boost the sector and will help to further reduce noise and carbon emissions. Proposals will be brought forward to support improvements to airspace and how to manage noise, including the way in which affected communities can best be engaged and whether there is a role for a new independent aviation noise body as the Airports Commission recommended. The Airports Commission concluded that even with the extra flights added by the airport’s expansion fewer people would be affected by noise from Heathrow by 2030 than are today. Following the clear recommendation of the Airports Commission the government conducted more work on the environmental impact. That work is now complete and confirms that a new runway at Heathrow is deliverable within air quality limits, if necessary mitigation measures are put in place, in line with the ‘National air quality plan’, published in December 2015. The UK has already achieved significant improvements in air quality across a range of pollutants. Emissions of nitrogen oxides in the UK fell by 41% between 2005 and 2014. Heathrow’s scheme includes plans for improved public transport links and for an ultra-low emissions zone for all airport vehicles by 2025. The government will make meeting air quality legal requirements a condition of planning approval. A draft NPS setting out why the government believes this scheme is the right one for the UK will be published in the new year when the public will be consulted on the proposals. In addition, up to £450 million could be available to local authorities through business rate retention. A Community Compensation Fund could make a further £750 million available to local communities. This will be determined through the planning process. Heathrow Airport expansion: background and technical reports. Airport expansion will be delivered through a thorough, faster planning process, under the 2008 Planning Act and 2011 Localism Act. The government will set out the airport scheme it wants, along with supporting evidence, in its NPS. Public and Members of Parliament will be consulted and there will be a vote in the House of Commons. This will be followed by a planning application by the airport to the Planning Inspector who will take a view and advise government of his decision. Final sign off will be by the Secretary of State for Transport and then construction will start. In time a new runway will also require the redesign of the airport’s flightpaths. This will form part of a wider programme of airspace modernisation which is already needed across the country in the coming years. The government expects to consult in the new year on a range of national proposals covering noise and airspace. Expansion at Heathrow Airport Ltd will be accompanied by a comprehensive package of mitigation measures which will be subject to consultation with the public as part of the draft NPS consultation process. The measures will also be subject to regulatory approval by the CAA. The Department for Transport has also set up a working group with Her Majesty’s Treasury and the Department for the Environment Food and Rural Affairs on air quality. This is part of a 10 year project to accelerate improvements in air quality. Today’s announcement follows an unprecedented UN global agreement achieved earlier this month to combat aviation emissions. Under the deal, airlines will offset their emissions with reductions from other sectors to deliver carbon neutral growth for the aviation sector from 2020. The government believes that a new runway at Heathrow can be delivered within the UK’s carbon obligations. Meanwhile, the government wants to see the continued prosperity of the UK’s second busiest airport, and the world’s busiest single runway airport, Gatwick. Its continued success will drive competition in the sector, which is good for passengers and the prosperity of the nation, drawing inward investment, trade and growth. The Airports Commission lead by Sir Howard Davies, was set up in September 2012. It published its final report in July 2015. In December 2015 the then Secretary of State for Transport Sir Patrick McLoughlin announced that government accepted the case for airport expansion in the south-east and the Airports Commission’s shortlist of options for expansion.